Vancouver, B.C……..Corvus Gold Inc. (“Corvus” or the “Company”) - (TSX: KOR, OTCQX: CORVF) announces initial assay results from new core hole NB-13-352 and additional assays from hole NB-13-353 which was partially released previously (NR13-22, September 18, 2013). Hole NB-13-352 encountered 270 metres of continuous mineralization, which included four separate zones of quartz veining. One zone of quartz veining returned 1.2 metres @ 3.07 g/t gold and 8.00 g/t silver and another returned 2.4 metres @ 7.57 g/t gold and 6.90 g/t silver. 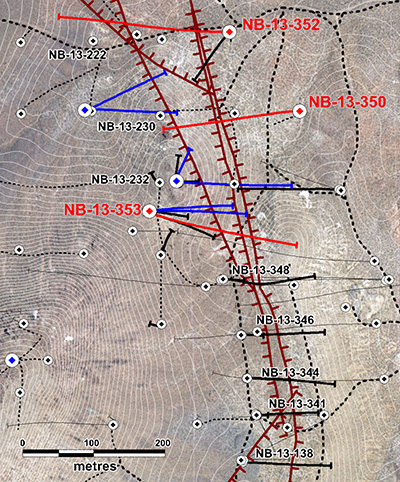 Hole NB-13-352 has now intercepted high-grade vein mineralization for a distance of nearly 650 metres, which mineralization remains open on all directions (Figure 1). Complete assays from NB-13-353 show that, in addition to the main vein (7.9 metres @ 10.36 g/t gold and 105.61 g/t silver), there are multiple zones of veining that extend the entire length of the hole (Table 1). These veined intervals occur in a variety of lithologies and, together with NB-13-350 (1.8 metres @ 2.35 g/t gold and 6.62 g/t silver), indicate that the corridor between the main Yellowjacket structures has the potential to host multiple new high-grade vein zones (Figure 1). Jeff Pontius, Chief Executive Officer, stated: “The extension of the Yellowjacket system several hundred metres to the north, as shown by holes NB-13-350 & 352, dramatically expands this high-grade portion of the North Bullfrog deposit. In addition, the multiple new vein zones identified in hole 352 and the recently announced new vein zone discoveries in RC holes to the west are outlining the potential for continued expansion of high-grade vein system to the west and north. When put in the context of the greater North Bullfrog District potential and the fact that Sierra Blanca is only the first of several high priority targets to be explored, the overall potential of the Company’s North Bullfrog property is demonstrably significant. *Intercepts calculated with 0.1 g/t gold cutoff and up to 3 metres of internal waste. Drill hole NB-13-352 was drilled approximately 150 metres north of NB-13-350, where the first eastern quartz veins were discovered. The silver to gold ratio in both holes suggests that the high-grade veins are part of the overall Yellowjacket system. The upper intercept in NB-13-352 is in the same structural position as the veining in NB-13-350, indicating a likely continuity of veining. The second high-grade intercept in NB-13-352 is in a new position and may represent yet another new vein zone. In addition to the quartz veining, mineralization in the bottom of NB-13-352 (23 metres @ 0.79 g/t gold) is associated with broad pyrite veining/replacement style of mineralization similar to that observed in the bottom of NB-13-350 (42.7 metres @ 0.76 g/t gold), as well as holes NB-13-230 (26 metres @ 1.2 g/t gold, NR-13-20 Sept 5, 2013), NB-13-232 (12.2 metres @ 0.97 g/t gold, NR-13-22 Sept 18, 2013) and NB-13-222 (53.3 metres @ 0.86 g/t gold, NR-13-18 August 7, 2013). This shows that this mineralization style occurs over a strike length of at least 250 metres, is over 100 metres wide and is open in all directions, particularly at depth. This new style of mineralization could represent a large new zone of gold mineralization that still remains within potentially open pit mining depths. This press release contains forward-looking statements and forward-looking information (collectively, “forward-looking statements”) within the meaning of applicable Canadian and US securities legislation. All statements, other than statements of historical fact, included herein including, without limitation, statements regarding the anticipated content, commencement and cost of exploration programs, anticipated exploration program results, the discovery and delineation of mineral deposits/resources/reserves, the potential to develop multiple Yellowjacket style high-grade zones, the potential to discover additional high grade veins or additional deposits,, the potential to expand the existing estimated resource at the North Bullfrog project, the potential for the North Bullfrog system to continue to grow and/or to develop into a major new Nevada gold system, the potential for any mining or production at North Bullfrog, the potential for the identification of multiple deposits at North Bullfrog, the potential for the existence or location of additional high-grade veins, the potential for the Company to secure or receive any royalties in the future, business and financing plans and business trends, are forward-looking statements. Although the Company believes that such statements are reasonable, it can give no assurance that such expectations will prove to be correct. Forward-looking statements are typically identified by words such as: believe, expect, anticipate, intend, estimate, postulate and similar expressions, or are those, which, by their nature, refer to future events. The Company cautions investors that any forward-looking statements by the Company are not guarantees of future results or performance, and that actual results may differ materially from those in forward looking statements as a result of various factors, including, but not limited to, variations in the nature, quality and quantity of any mineral deposits that may be located, variations in the market price of any mineral products the Company may produce or plan to produce, the Company's inability to obtain any necessary permits, consents or authorizations required for its activities, the Company's inability to produce minerals from its properties successfully or profitably, to continue its projected growth, to raise the necessary capital or to be fully able to implement its business strategies, and other risks and uncertainties disclosed in the Company’s 2013 Annual Information Form and latest interim Management Discussion and Analysis filed with certain securities commissions in Canada. All of the Company’s Canadian public disclosure filings may be accessed via www.sedar.com and readers are urged to review these materials, including the technical reports filed with respect to the Company’s mineral properties.